Artichokes just make things taste better! Enjoy this high protein, low-fat dip with crackers, pita bread or veggies. 1 1/2 cups or 1 15 oz can of cooked white beans (navy, cannellini or great northern). If using canned, rinse and drain. 1 1/2 cups or 1 15 oz can of artichokes. Rinse and drain. Wash the lemon. Using a microplane or very fine grater, gently scrape the outer yellow peel off the lemon. Put the beans, artichokes, lemon juice and zest and salt into the food processor. Turn on and, though the feeder, slowly pour in the vegetable stock in until it is smooth and creamy. Transfer to a bowl and fold in the parsley.Top with optional olive oil. Serve with crackers, rice cakes, pita bread or veggies. If cooking beans from scratch, see Bean Cooking Chart for details. 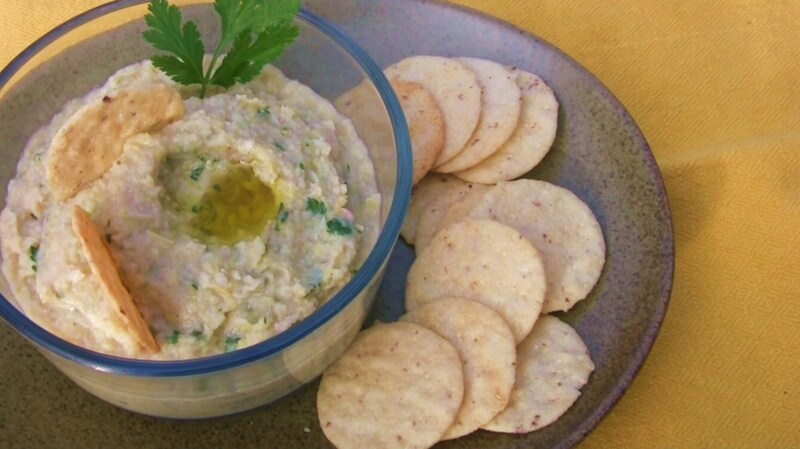 Artichoke and White Bean Dip can also be used as a sandwich spread or a layer in a wrap.